Of the four theme parks in Walt Disney World, Disney’s Hollywood Studios is experiencing lots of change at the moment with the addition of Star Wars Land and the coming of new attractions such as Mickey and Minnie’s Runaway Railway. Despite lots of change and construction, the park is still an amazing place for guests to spend lots of time and some might be overwhelmed trying to figure out how to enjoy everything in just one day. Luckily there are some great tips and tricks that guests can follow that will help them to make the most of each minute in Disney’s Hollywood Studios and have the opportunity to see and enjoy it all. From big thrills to character meet and greets and more, there is much to enjoy in the park. Here is the perfect plan for how to fit fifteen activities at Disney’s Hollywood Studios into one day at the park. The best way to ensure that guests can fit as much as possible into one day at Disney’s Hollywood Studios is by arriving for rope drop. This entails getting to the park before it officially opens and waiting to be let inside which ensures that guests are some of the first to enter each morning. By arriving early, guests can beat many of the crowds that typically begin to arrive later in the morning and thus enjoy popular attractions with much lower wait times. 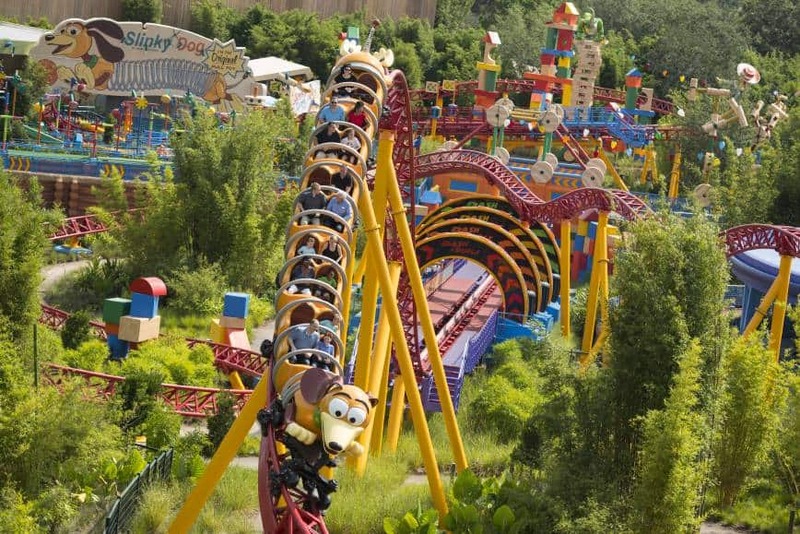 After the park officially opens, guests should head directly to Toy Story Land and get on line for Slinky Dog Dash. This new attraction is extremely popular and has guests go for a whirl on a track built by Andy himself. With two launch sequences and lots of air time thanks to smooth track and high hills, guests are sure to love this attraction. The best time to enjoy a ride on Slinky Dog Dash is first thing in the morning before the wait time reaches high volume. After enjoying Slinky Dog Dash, guests should head to another popular attraction in Toy Story Land. Alien Swirling Saucers has guests board spaceships with the beloved little Green Aliens and take off on a whirling and twirling experience that is out of this world. 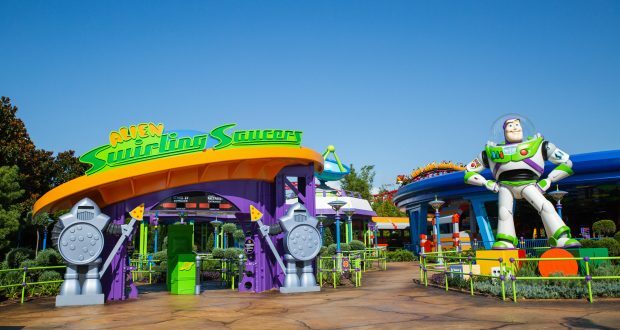 With gentle whips around each turn and futuristic details, Alien Swirling Saucers is a must do attraction in Disney’s Hollywood Studios and typically has much lower wait times in the mornings. 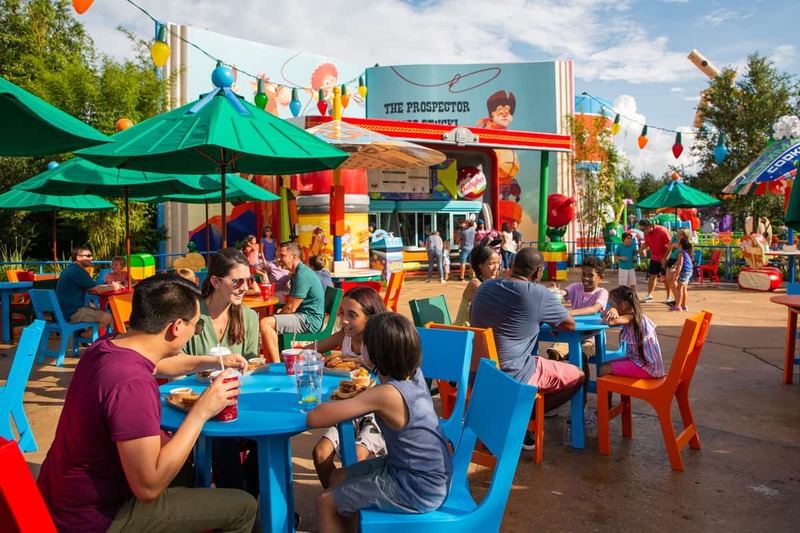 By this point, guests are sure to be hungry and Toy Story Land has a wonderful quick service location that serves up popular and delicious breakfast options. Woody’s Lunch Box is charming with its larger than life toy details and guests are sure to love the many options that the location has to offer. Some popular breakfast meals include the Breakfast Bowl, S’more French Toast Sandwich, Smoked Turkey Breakfast Sandwich, Raspberry Lunch Box Tart, Potato Barrels, and Banana Split Yogurt Parfait. The final attraction in Toy Story Land is the only one that originally existed before the creation of the area, however it is still incredibly popular with guests. Toy Story Mania has guests don 3D glasses and take aim at different targets in a series of midway games hosted by the characters of Toy Story. Since Toy Story Mania is so popular, it can often have lengthy wait times making it the perfect choice for a FastPass in Disney’s Hollywood Studios. Sunset Boulevard in Disney’s Hollywood Studios is home to several popular experiences including the ominous attraction The Twilight Zone Tower of Terror. The experience brings guests into the Hollywood Tower Hotel where they soon find themselves in for the same fate that five unlucky hotel guests experienced many years ago. The Twilight Zone Tower of Terror is a very popular attraction in the park and guests are smart to save time by booking a FastPass for the experience. Found right next to The Twilight Zone Tower of Terror is another popular attraction that typically has lengthy wait times. 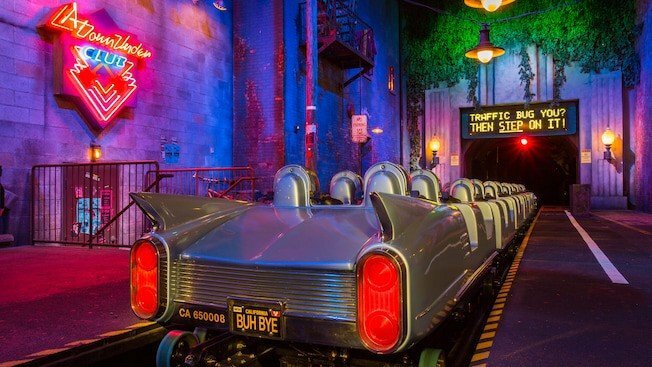 The Rock ‘n’ Roller Coaster Starring Aerosmith straps guests into super stretch limos and rockets them through the neon lights of downtown to make it to the band’s concert on time. Guests who want to enjoy the thrilling experience without spending lots of time on the standby line should opt for the single rider line. This option typically is a much shorter wait time so long as guests don’t mind their parties being split up at the loading platform. After enjoying the two thrilling attractions of Sunset Boulevard, guests can head down the street to experience a live retelling of a classic Disney animated film. Beauty and the Beast – Live on Stage tells the story of Belle and the Beast as they fall in love. Musical numbers, familiar characters, and special effects bring this classic tale to life and guests will also love recharging in the shady amphitheater while enjoying the show. Guests should then head over to the other side of Disney’s Hollywood Studios to enjoy another thrilling attraction that is the perfect choice for their third FastPass of the day. Star Tours – The Adventure Continues bring the universe of Star Wars to life and has guests embark on a Star Tours flight. Soon it is discovered that a Rebel Spy is on board and a series of thrilling 3D scenes occur with familiar locations and characters. After enjoying Star Tours – The Adventure Continues, guests should head to the nearby Grand Avenue area of Disney’s Hollywood Studios to enjoy a light lunch at a charming location. 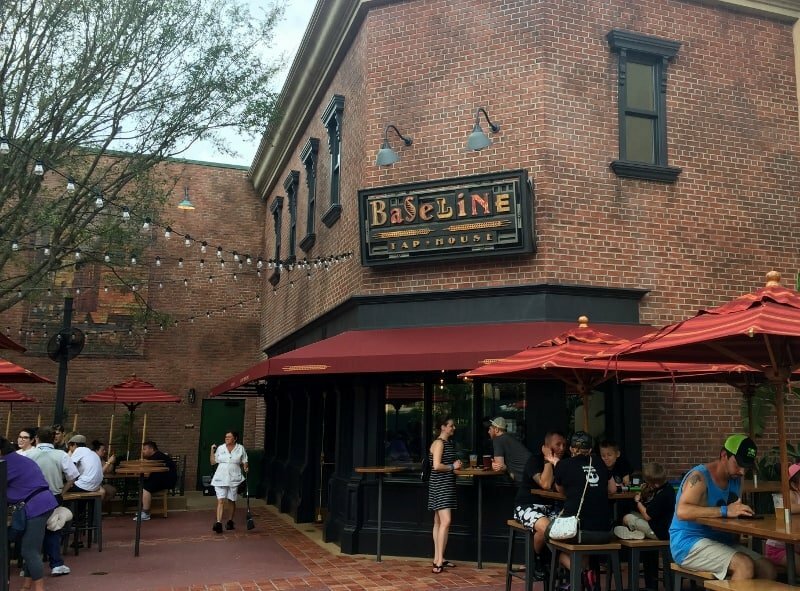 BaseLine Tap House brings the cool and sophisticated feel of California to life through a small location with brick accents, lots of details, and an outdoor patio. Guests can sip on wine and beer from California while nibbling on options such as the Bavarian Pretzel, California Cheese and Charcuterie Plate, and Coffee-Rubbed Rib-Eye Steak Puff with Olive Salad. 11. Indiana Jones Epic Stunt Spectacular! After enjoying lunch, guests can head over to Echo Lake to enjoy a thrilling live performance that brings one of the most beloved film characters to life. The Indiana Jones Epic Stunt Spectacular! shows guests how some of the most popular stunts in the film series were executed safely using special effects and highly trained stunt professionals. In addition to the live action, guests are also provided with the opportunity to be an extra in one of the scenes which makes for an unforgettable memory! Back over in the Animation Courtyard area of Disney’s Hollywood Studios, guests can explore all things Star Wars while also enjoying air conditioning. The Star Wars Launch Bay is a wonderful location for guests to spend lots of time exploring thanks to its exhibits of props and costumes from the films and a sneak peek of the most recent film Solo: A Star Wars Story. Guests might also find themselves face to face with storm troopers and can even meet Chewbacca, Kylo Ren, and BB-8! Found next door to the Star Wars Launch Bay is another live show that brings the story of a beloved Disney Princess to life. Voyage of the Little Mermaid combines live action, puppets, animation, special effects, and more to bring the story of Ariel and Prince Eric to life on stage. 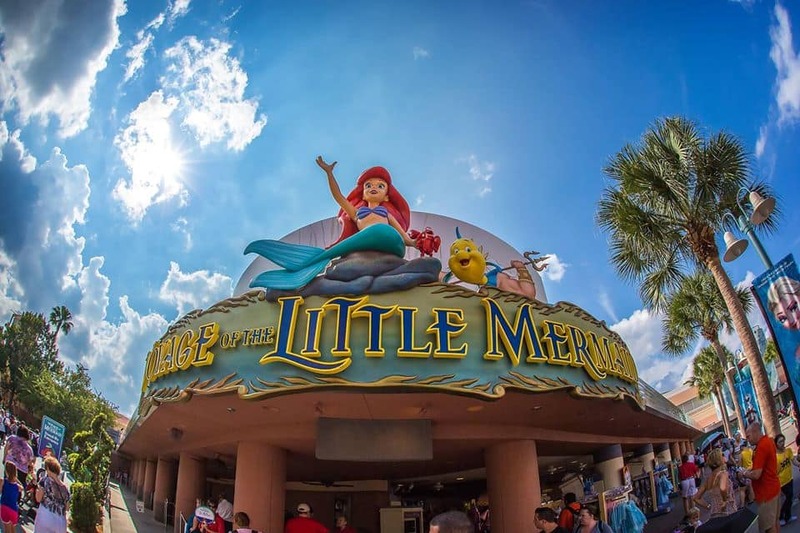 Guests will absolutely love the themed theater where they will feel as though they have entered the undersea world of Ariel and all of her friends. The perfect way to wrap up any day at Disney’s Hollywood Studios is by enjoying a full service dinner at the Hollywood Brown Derby. This popular restaurant is designed to look like its iconic counterpart in Hollywood and serves up contemporary American cuisine. Some popular menu options include Char-Grilled Filet of Beef, Faroe Island Salmon, Duck Two Ways, Our Famous Cobb Salad, and Black Grouper and Lobster Cioppino. Guests can opt to book a dining package that includes not only dinner at the restaurant but also priority seating for the park’s amazing nighttime show. After enjoying a delicious dinner, guests can head back down Sunset Boulevard to the massive Hollywood Hills Amphitheater. The location is home to the nightly spectacle Fantasmic! which tells an epic story of Mickey and the battle between good and evil in his imagination. Guests who enjoy the Fantasmic! dining package can experience priority seating towards the front of the amphitheater where the special effects and amazing story are brought to life!